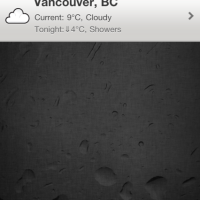 Degrees is a new Canadian weather app that really brings style to the idea of weather. The suave of the app really begins with its home screen icon, but the real fun of the app is inside. 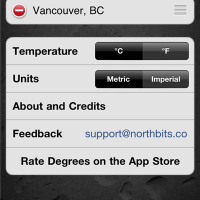 The Degrees app is extremely intuitive and simple to use. For a weather app, which is typically overly complicated or just plain boring, Degrees does a fantastic job of making information flow very nicely in an engaging way. The interface feels very modern, with simple taps and gestures revealing valuable information such as the temperature, the high/low, wind, visibility and much more. I particularly like how rain is indicated which is simply stated as “showers” or “periods of rain” or whatever the forecast may be. Really nice. The way the app lists locations in a list format is also really great. 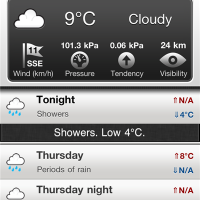 This way, users can easily and quickly see all of their locations plus the current and upcoming temperate and weather. 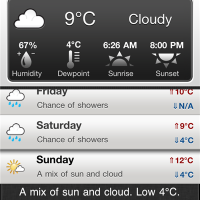 For a weather app, Degrees is an A+. Degrees is available in the App Store for $0.99. Today I have FIVE copies of Degrees to giveaway to iPhoneinCanada.ca readers! Throughout the day, I will drop the five promo codes into the comments section below. 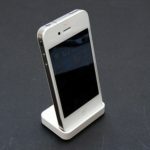 Be the first to get one to win!